The Oscars… many call it the most famous catwalk. Held Sunday night, March 4th at the Dolby Theater in Los Angeles, the red carpet at 90th Annual Academy Awards became as much as a film industry event as it is a fashion show. Presenter Nicole Kidman wore an Armani Privé electric blue silk lamé bustier strapless gown with an oversized bow accenting the waist. Roberta Armani wore an Armani Privé black one-shoulder crinoline and tulle gown fully embroidered with patent leather ribbon and multi-colored crystals. Elizabeth Chambers wore a black one-shoulder silk jersey plissé gown. The shoulder is adorned with amber beading and crystals. Winner Guillermo del Toro wore a Giorgio Armani Made to Measure midnight blue one-button peak lapel tuxedo with a classic white evening shirt and a bow tie. 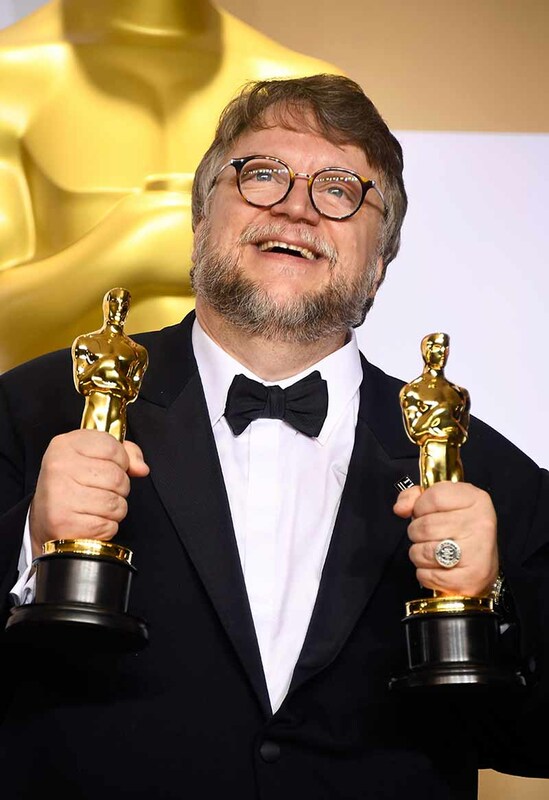 Del Toro was awarded for Best Director for his film “The Shape of Water,” as well as Best Original Screenplay. Nominee and performer Common wore Giorgio Armani Made to Measure ensembles during the evening. On the red carpet the nominee wore a charcoal gray one-button peak lapel tuxedo trimmed in black velvet along with a classic white evening shirt and a bow tie. For his performance, he wore a black velvet two-button notch lapel dinner jacket with a black wing collar evening shirt and a bow tie. “Stand Up for Something,” which was nominated for Best Original Song was co-written by Common. Nominee Benj Pasek wore a navy blue two-button peak lapel microdot pattern tuxedo trimmed in grosgrain with a classic white evening shirt and a bow tie. “This Is Me,” which was nominated for Best Original Song was co-written by Pasek. Bryan Fogel wore a Giorgio Armani black two-button shawl collar tuxedo with a classic white evening shirt and a bow tie. Fogel directed “Icarus,” which was awarded for Best Documentary Feature. Claes Bang wore a Giorgio Armani black double-breasted peak lapel tuxedo with a classic white pleated evening shirt and a bow tie. Bang stars in “The Square,” which was nominated for Best Foreign Language Film. Chris Messina wore a Giorgio Armani black two-button notch lapel tuxedo with a classic white evening shirt and a bow tie. Gal Gadot wore an Armani Privé red crystal embroidered sleeveless gown that features a deep plunging draped neckline. Sally Hawkins wore an Armani Privé gold silk jacquard coat a black silk top and a lace skirt. Lupita Nyong’o wore an Armani Privé black cut-out gown adorned in amber crystals and features a deep plunging neckline. Ava DuVernay wore an Armani Privé midnight blue long sleeve tulle gown decorated with a dark blue leaf motif overlay. Sofia Richie wore a Giorgio Armani taupe strapless gown with a multi-colored motif beading overlay. Charli XCX wore a Giorgio Armani black crepe satin halter gown with a leather chain necklace detail. Camila Mendes wore a Giorgio Armani black chiffon gown with a bodice adorned in black, orange and purple sequins. Ricky Martin wore a Giorgio Armani midnight blue two-button notch lapel houndstooth pattern tuxedo trimmed in grosgrain with a classic white evening shirt and a bow tie. Matt Bomer wore a Giorgio Armani midnight blue leaf motif pattern one-button peak lapel tuxedo with a classic white evening shirt and a bow tie. Darren Criss wore an Emporio Armani ruby red textured velvet one-button shawl collar dinner jacket trimmed in black satin with a classic white covered placket evening shirt and a bow tie.